Dancers and performers need to take special considerations in their diet in order to provide enough energy and nutrition to keep up with a demanding lifestyle. There are many foods that can affect your stamina, muscle strength, mental clarity, and even your mood. There is one thing I make a point to eat before every show – a banana. Stage fright can be crippling and everyone experiences it to some degree from time to time. Our bodies actually respond to performing as a fight-or-flight situation, and this spurs an increase or sudden spike of adrenaline and cortisol. Adrenaline can seem to slow down time, give a boost in muscle function, heighten the senses and block out pain. The effects of adrenaline can cause stage fright, with varying symptoms such as increased heart rate, sweating, shaking, nausea, anxiety, inability to concentrate, and the feeling of butterflies in the stomach. Enter, the humble banana. Bananas are high in natural beta blockers, which work by blocking adrenaline receptors. Doctors prescribe beta blockers to reduce heart rate and blood pressure or treat anxiety. In the smaller amounts found in foods like bananas, it seems to take the edge off, allowing the benefits of adrenaline surges to outweigh the negative side effects. Bananas are also high in potassium and magnesium, which are essential for muscle function, and tryptophan, which has a further calming effect. Other foods high in beta blockers include potatoes, pomegranates, turkey, oatmeal and broccoli, as well as the herbs chamomile and valerian. I personally love bananas because they are portable and easy to eat quickly. I tend to eat one at breakfast, and another about an hour before performing. What is your favorite pre-show snack? What do you do to cope with stage fright and anxiety? I am currently in a cleaning and repairing overhaul. 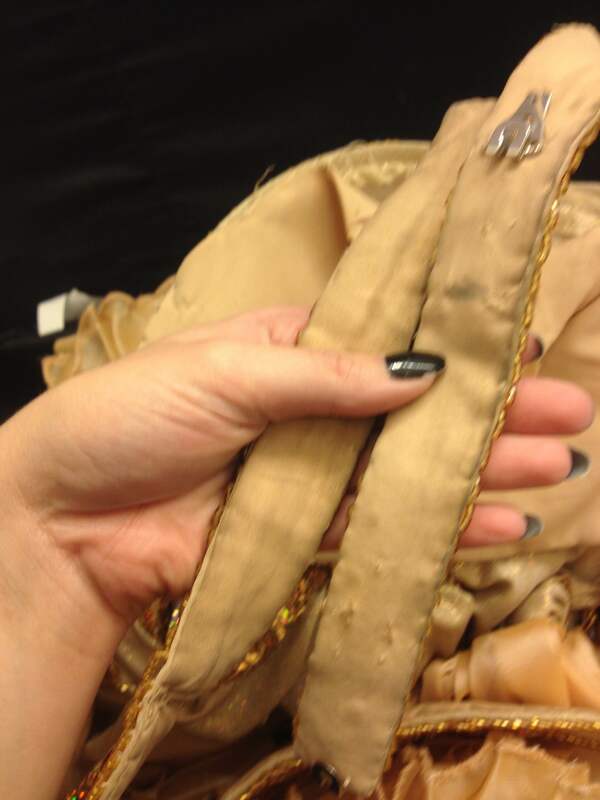 Once I found myself hesitating from grabbing several of my costumes because of loose hooks, grungy straps and missing stones or broken fringe, I had to make time for some TLC. Performing several shows a week is hard on you, and it’s hard on your costumes. Think about how dirty you are when you come home from a night of shows. I reach for my favorite three or four costumes on a pretty regular basis. My poor orange costume got a real beating this October, getting worn for about three sets a week. 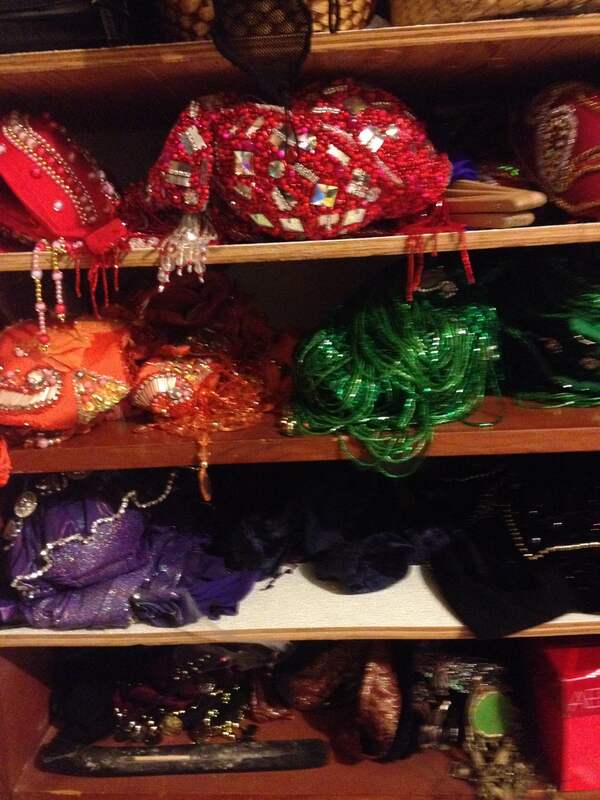 When you finally take a close look at your glamorous, expensive costumes, you may be shocked. 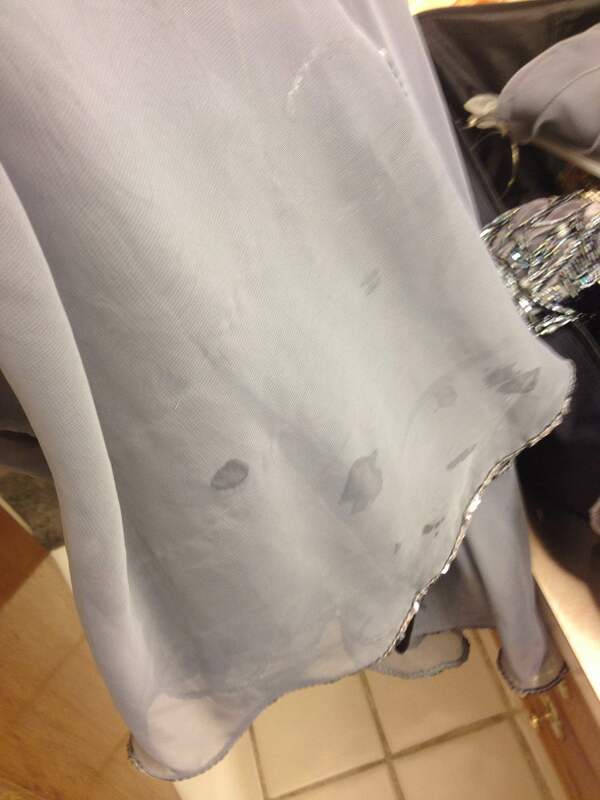 Some dancers don’t know what to do and start to feel their costumes are getting ruined. In fact, I have known dancers who never wash their costumes, or sell them for hundreds less than they are worth for fear of cleaning them. With a little TLC, my costumes always come out looking brand new. Cleaning skirts is pretty simple. If it’s velvet, cotton, lycra, sturdy chiffon or standard spandex, you can usually machine wash it in cold water on delicate cycle and hang to dry. With cheaper or some overseas fabrics ALWAYS test for colorfastness before washing. I purchased some Bollywood costumes that could not be washed because the dye was not set properly. If the skirt has beading of any kind, or if it’s metallic, glittery, etc, it will need to be hand washed. I always hand wash my chiffon skirts from Pharaonix and Bella. First I thoroughly soap up the hem area and anywhere with spots. You can use Borax, Woolite or baby shampoo, but honestly I use regular soap, since it breaks down body oils. Rinse, and if there is still gunk, I scrub the last few inches of hem with a soft body brush and soap. The gold skirt took four wash/rinse repetitions to finally come out clean. Don’t soak sequins too long. Holographic sequins will flake a bit, especially if you agitate them. 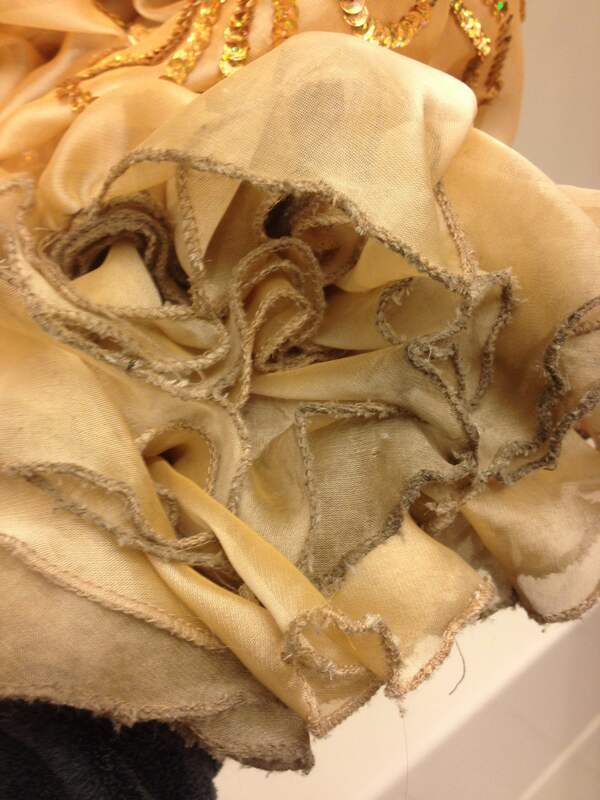 To dry, gently roll the fabric in a towel and press. Don’t twist or wring too much, you’ll damage the beading and stretch out the fabric. Then lay flat on a towel or hang up to drip dry. The inside of your bra is probably the second dirtiest part of your costume, next to the hem of your skirt. Again, here, I take my brush and soap and scrub the straps and lining. Don’t get the beaded side wet yet. The edges of straps and cups are always the dirtiest, and, unfortunately, more delicate. Gently rub to get the dirt and oil out but avoid damaging the threads. Usually by the time my costumes are grungy, they need some reinforcement, so I will often just go back and whipstitch the edge after cleaning, as the threads are often coming loose by this point anyway. Next, flip the costume over, dunk it in cold water and swish it a little bit. With a soft baby toothbrush, take soap and lightly brush over the large crystals. You’d be surprised how cloudy and gunky they get, even though they aren’t against your body or dragging on the floor. Rinse under running water, and squeeze water out gently. Wrap in a towel and press, then leave it to dry flat. I keep my costumes in the open air to store. Never put your costume in a sealed bag, especially after a gig. Let your costume dry, or all of that sweat will quickly make your costume smell musty. Fighting odors is more about prevention. I put paper towels and silica packets in my costume bags to absorb moisture. You can regularly spray the inside of your costumes with vodka. This kills bacteria which cause odors and evaporates, leaving no residue. – If you wash one part of your costume, sorry, but you need to wash all the matching parts. You’ll always lose a little bit of dye when you wash. If you wash your skirt but not your veil, they will become different colors. This doesn’t mean you need to wash the whole thing every time, but if you wash your bra, wash the belt and arm bands, or wash your skirt and your veil. – If you’re selling a costume, take a little extra time to wash it and do minor repairs. You will be able to get a higher price if your costume is in like-new condition. You may even decide to keep it when it comes out all squeaky clean and sparkly! A little late posting my schedule! Here is my public schedule for the rest of October, and November. Hope to see you one of these nights! Hand-Picked Musical Selections for Bellydance, Tribal Fusion, Folkloric Dance and More. 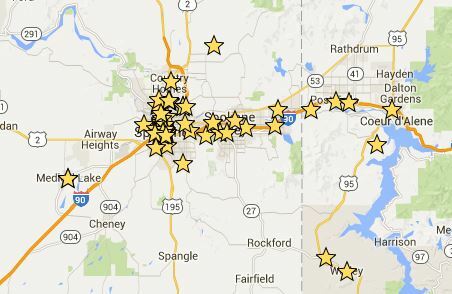 This post is a work in progress and will be updated regularly. I spend hours combing through music and making playlists and I’d like to share that effort with others! Here are my absolute favorite recommendations, organized by category. Leave a comment if you found something you like. Happy listening! Dancers of all levels welcome to perform, contact Sue to sign up! August 26-30 Emerald Sanctuary Retreat Emerald Sanctuary is an annual belly dance retreat in the high desert of Eastern Washington. Regional and local instructors offer an exciting range of workshops for the beginner to the seasoned dancer. 1st Friday featuring Kori, Stephanie, Kendra, Paloma Skye and Nickie B. Students often ask me where to find bellydance music. Of course, there is a plethora of music available on Amazon and iTunes, but there are some other wonderful resources out there. Before we dive in, I’ll talk about finding music you like. It can be difficult to make a selection without hearing the music, or even hearing a 30 second clip. Pandora is a popular choice, but has limited selections of actual Middle Eastern music. Spotify has a much better selection, and you can listen to things without skipping around. I make playlists, “star” what I really love and purchase music I like the most. I watch DVDs and videos on YouTube constantly, and you can use Shazam to identify music you fall in love with. Of course, this will only lead you to modern music integrated into these systems. You really have to dig to find the vintage and truly foreign stuff. No matter what, you will buy tons of music you don’t ever perform. But you can use some for listening, practicing, and just learning. On Maqam and Maqam mp3 you can find a wealth of authentic music. Everything from tribal fusion to khaleeji, and even some very rare and vintage recordings. Maqam has very handy categories including birthday, Eid and wedding, so you can find appropriate music for many situations. You can even buy instruments, instructional tools, and collections of music. A real treasure trove! Bellydance.com has a wide section of CDs, including many for under 5.00. This is a wonderful opportunity to develop your taste and find what you like. They have an even wider selection in the 10-20 dollar range as well. Their customer service is excellent and I always get my order in about two days. Bhuz is a great resource all around, with forums on every topic imaginable and a word wide swap meet. I scan bhuz almost daily for used music and costuming. You can also discuss music choices and get recommendations from people all over the world. A lot of really great artists have music available on bandcamp.com, such as House of Tarab and Beats Antique. Possibly the best thing about Bandcamp is that a much larger chunk of proceeds from each sale actually goes to the artist, and you can even round your purchase up and make a donation. I appreciate the ability to choose the download format, including lossless formats such as WAV, FLAC and OGG. Always go to haflas! You never know who is selling their music or costumes, and of course it is worth it to support your community and get inspiration. Large events such as Med Fest have lots of vendors, and many of them sell music! If you can play records or convert LPs to mp3s, I recommend always checking out the records at your thrift stores and antique stores. You never know what you will find! Music from LP isn’t always high enough quality to perform in a professional setting but there are some real gems. If you know someone with proper equipment, you can also have old tracks cleaned up and remastered digitally. Radio Bastet is a podcast of amazing vintage music. Listen and learn! I hope you found some useful resources. Good luck on your musical odyssey!